Ottenweller Company offers much more than the manufacturing of individual parts for their customers. After the Ottenweller skilled staff and extensive equipment outputs each individual item, it is then passed to the Module Assembly and Paint Technologies division. This is where concept is taken to completion. 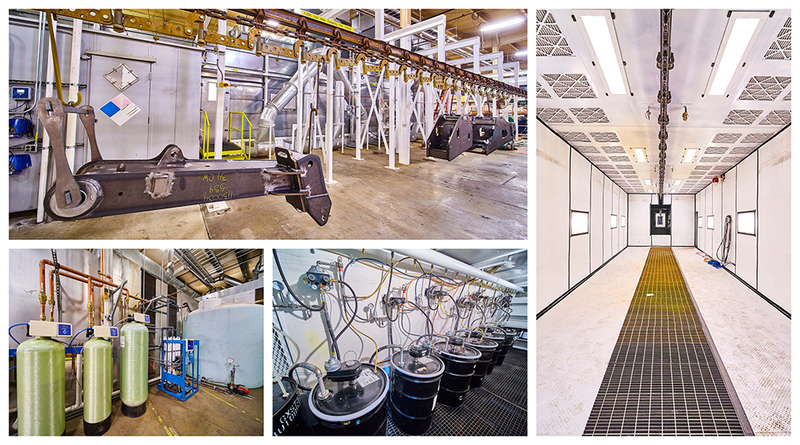 Ottenweller Company supports production painting requirements through our automated converyorized system. Combined with our 5-stage iron phosphate pretreatment process we provide multi color topcoat components that meet our customers demanding standards. The CNC controlled Graco paint system moves, measures, controls, and dispenses a two-part epoxy paint that is cured in our 200' oven. The manual spray booths are large enough to accommodate large fabricated components and utilize the same Graco mixing system for accurate paint ratios.